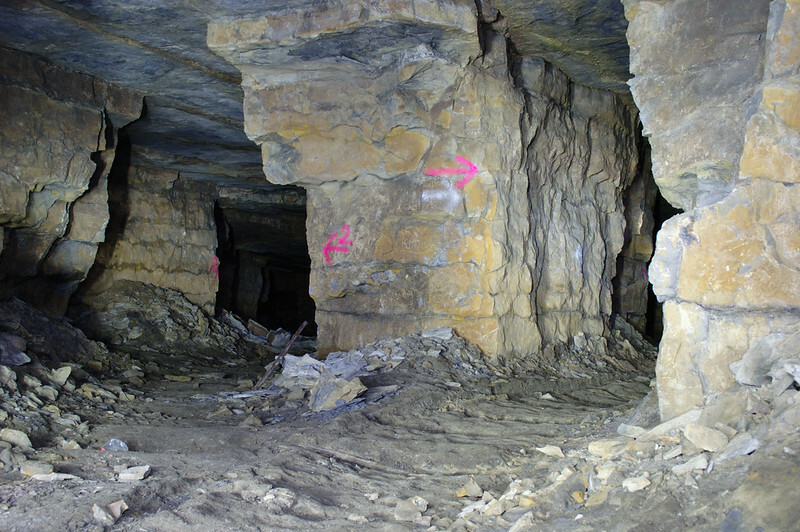 This was my second mine explore, after exploring a small limestone mine last year. But I knew of a much bigger, more interesting mine and had been intending to take a look for a while. Last weekend I finally paid it a visit. 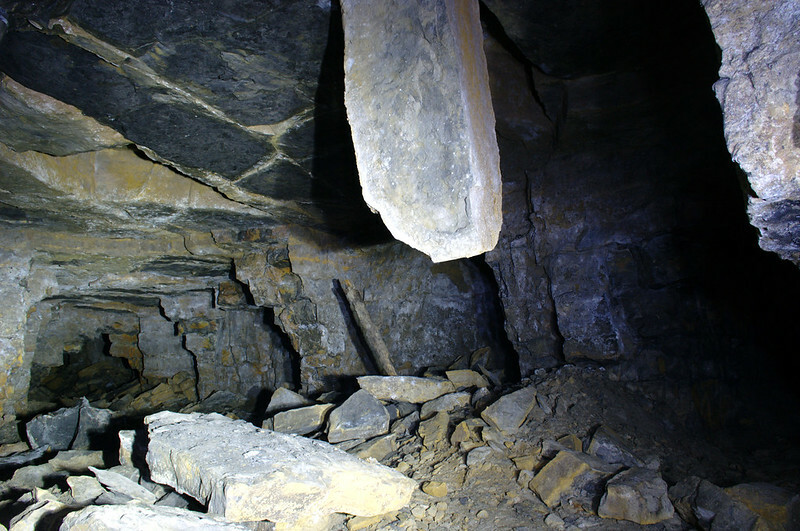 Although this is, by all accounts, a relatively safe mine (physically stable and with good air), I was still slightly apprehensive about the explore, and I wouldn’t have risked going far inside if I hadn’t had some experienced guides with me. You may be highly unlikely to end up buried under a rockfall or poisoned by bad air down there, but it would be very easy to get completely lost if you didn’t know your way around. At first I thought I knew the way back to the exit, but after we’d turned a few corners and stopped off to examine some interesting features, I wasn’t so sure anymore, and was glad that my companions seemed so confident of where we were going. 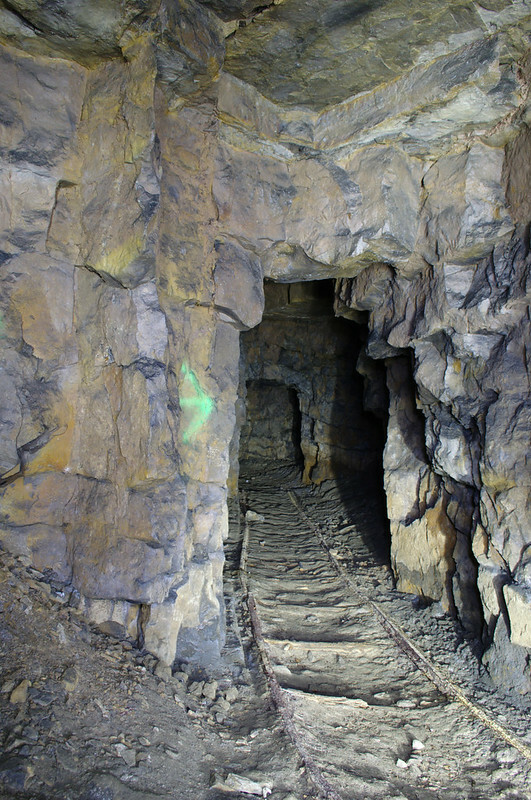 This mine is huge, with passages leading off in all directions, and multiple entrances and exits – after our two hours or so underground, we emerged blinking into the daylight some distance away from where we’d gone in! Even my guides, who’ve been in there countless times between them, estimated that they’d only ever explored a small fraction of what’s down there, and I could well believe it – fully investigating all of the numerous tunnels that we walked past would be a massive task. It was a very different experience from the railway tunnels I’m more familiar with. In most tunnels, even if you switch off your torch, there’s still some light filtering in through the portals, and you could probably just about feel your way out along the wall if your torch failed in there – in the mine, you wouldn’t have a hope unless it happened very close to the entrance, as it’s absolutely pitch black without the torches. 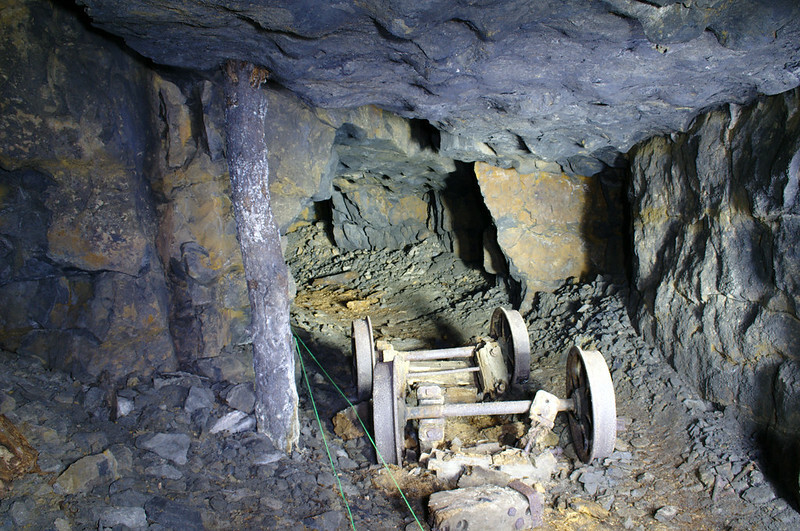 Everything sounds different as well – tunnels are very echoey and sound travels a disconcertingly long way down them, but the mine had a very flat and dead acoustic in comparison. Light painting to illuminate long exposure photos is much easier in a tunnel than in a mine as well, because of the regular shape. In addition to all of the impressive rock formations, there was also clear evidence that this was no natural cave system. 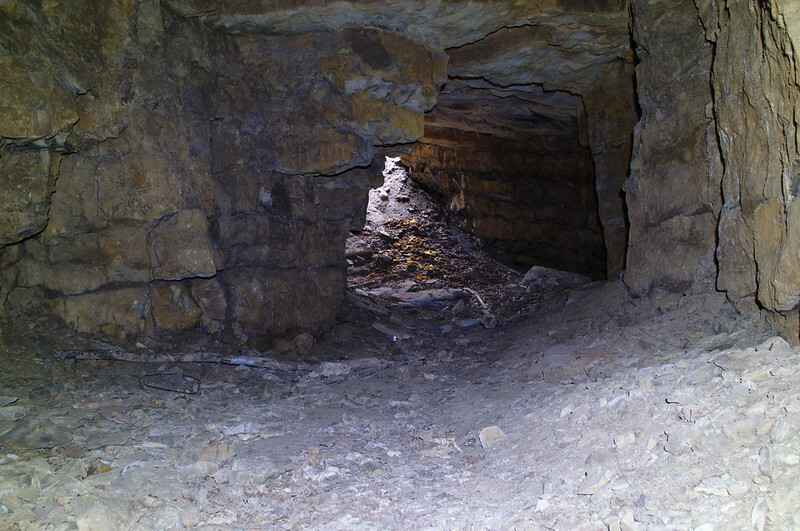 The bore holes where explosives were placed for blasting could still be seen in places as channels on the surface of the limestone, and there were frequent wooden props between floor and ceiling, and even a whole wall built of thin, slate-like stones at one point. But my favourite of the manmade remains was definitely the minecarts. Although they feature heavily in Indiana Jones and the Temple of Doom, as well as various old adventure game series that I used to be addicted to, I’d never seen one in real life until now. We saw two of the wheeled cart bases on our underground walk, as well as the rusted and decaying metal containers that used to sit on top lying nearby. In places, the rails that the carts once ran along were still in place, and elsewhere you could see where they used to run. The whole experience actually reminded me a bit of playing Minecraft. 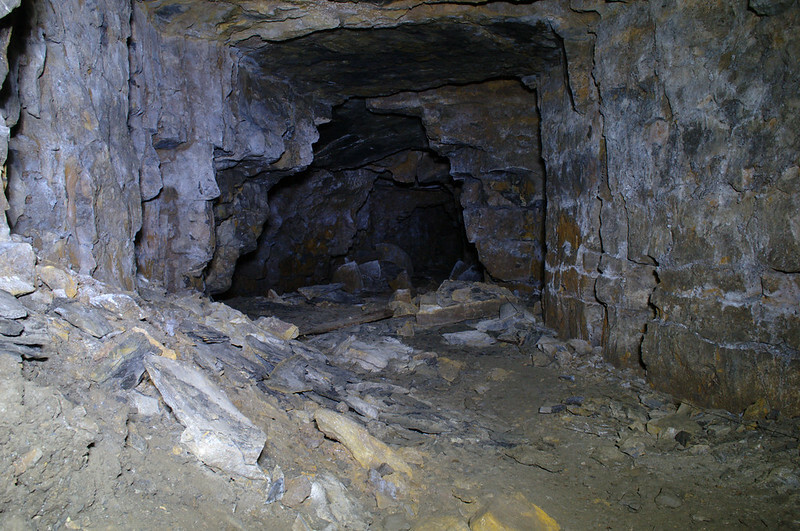 Seeing what was round the next corner of the real mine evoked similar emotions to exploring a new cave system in the game. Though thankfully we didn’t meet any creepers in real life… or run out of torches and have to dig our way back up to the surface in total darkness.